Includes 1 pallet to paint & 1 drink of your choice. 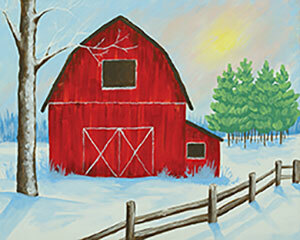 Join us for a paint and sip night with The Painting Trowel. 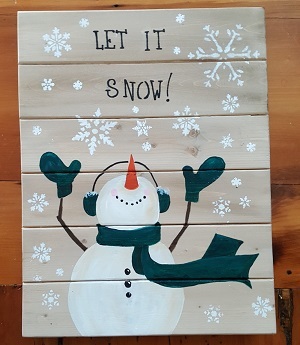 You'll be painting a wooden pallet perfect for the holidays! Ticket price includes a choice of a specialty cocktail, glass of wine, or beer. Food is available to purchase from The Bus. You have the option of painting either of the two pictures below on a wooden pallet. Please note that we have TWO locations for you to visit us. ORANGE COUNTY DISTILLERY, PRODUCTION FACILITY - For tastings, bottle purchases and a view of our production area. ORANGE COUNTY DISTILLERY AT BROWN BARN FARMS, COCKTAIL ROOM - For cocktails, beer, wine, cider, tastings, bottle purchases & live music on weekends. Please see below for address and hours for both locations. We are able to accommodate large groups at Orange County Distillery at Brown Barn Farms. HOURS - BY APPOINTMENT ONLY. WE CURRENTLY HAVE VERY LIMITED AVAILABILITY. PLEASE CONTACT US AT INFO@ORANGECOUNTYDISTILLERY.COM AND WE WILL DO OUR BEST TO ACCOMMODATE YOU.